After witnessing another beautiful sweetie cake at a party I attended recently I thought it was about time that I googled them to see how readily available they are to buy. To my suprise it doesn't look like that many people make them. The most local to me was a lady in Herne Bay, Kent running a company called Sweets Stuff. Their cakes look truly delicious and after reading through her site I discovered that the consumer can put in sweet requests for their cake. For example, my favourite sweets are fizzy fangs, strawberry dreams, bananas, mushrooms... (the list goes on a little) - but I could give them a weeks notice with the choice of sweets for the cake I fancy. These cakes are a brilliant idea and are actually very good value for money starting from just £13. 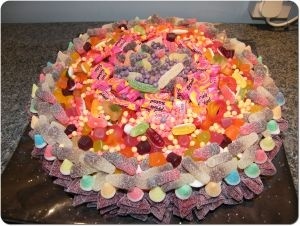 If you offer sweetie cake services and would like to appear here then get in touch.